Many beginning and advanced PhD’s have questions about their PhD project and all this entails. These workshops will cover some of the most frequently raised questions, concerning aspects of publication, research funding, and academic networking. They also offer participants the opportunity to meet their peers in a relaxed atmosphere. 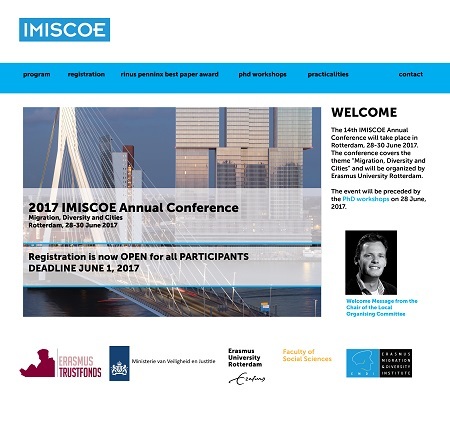 Following the success of the 2016 PhD Workshop, which took place during the 13th Annual IMISCOE conference in Prague, the next IMISCOE PhD Workshop will take place on 28 June 2017 during the 14th Annual IMISCOE Conference in Rotterdam. This will be a complementary activity for PhD students in the IMISCOE network, focusing on academic skills that are particularly relevant for PhDs in the field of migration studies. As was the case in Prague, the workshop will be organised in the morning of the first day of the conference, just before the official opening of the program. More details here. On the 2nd day of the Rotterdam conference - Thursday 29 June: 19.00-19.45, IMISCOE organizes a meet-the-authors book panel, which contains an interactive discussion with several authors who have recently published a book in the IMISCOE-series. Have a look at the following books and ask questions to the authors! The bookpanel will be followed by a wine reception. Please follow our newsletter, to find out more on this event. The coordination of Europe’s largest network of scholars on migration, integration and social cohesion remains at Erasmus University Rotterdam. 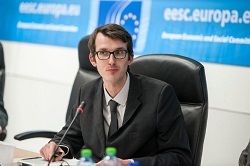 In 2014, the EUR was granted its’ first period as coordinator of the IMISCOE Network. In February 2017, the IMSICOE Board of Directors has decided to grant EUR a second term as coordinator, from 2018 to 2022. IMISCOE has an annual PhD Summer school, in the past organized among others in Rotterdam, Antwerp, Barcelona, and at Princeton. IMISCOE is now looking for interested institutions, or teams of several institutions, to develop bids to host the IMISCOE PhD Summer school 2018. Bids should be submitted to the IMSICOE office by 15 May 2017. Bids should be sent as PDF attachments to the IMISCOE network office, to C. Jochemsen (jochemsen@fsw.eur.nl). Any questions regarding the Call for bids can be directed to the IMISCOE network office or the IMISCOE Training Committee, to Marta Bivand Erdal (marta@prio.org). IMISCOE is proud to announce that the Open University in London has joined the network whereas the Institute for Migration and Ethnic Studies at the University of Amsterdam has rejoined the network. Scholars from various departments of Erasmus University Rotterdam have decided to work together in order to address such cross-disciplinary questions raised by migration and diversity. They recently launched the Erasmus Migration and Diversity Institute (EMDI), which has as the main objective to deepen cross-disciplinary collaboration in research on migration and diversity and to position EUR in the rapidly developing international field of migration research. The institute will be supported by the Erasmus Initiative (EI) and will also host the network office of IMISCOE, Europe’s largest network of academic research institutes on migration. The Center for Ethnic and Migration Studies (CEDEM) of the University of Liège is glad to welcome applications for the third edition of the IMISCOE 3CI PhD Winter School ‘Migration and Urban Change'. Deadline for applications is September 15th 2017 at 5pm. 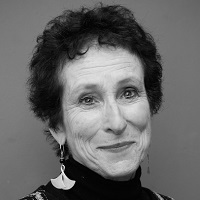 Eleonore Kofman (Professor of Gender, Migration and Citizenship at Middlesex University) has been appointed as member of IMISCOE's Executive Board. 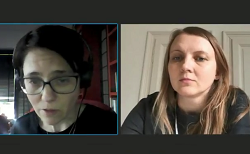 Preview of an interview with Olena Fedyuk and Marta Kindler on "Ukrainian Migration to the European Union: Lessons from Migration Studies (Imiscoe Research Series)", by Olena Fedyuk (Editor), Marta Kindler (Editor), from Warsaw, Poland and Budapest, Hungary, 1 March 2017. The Board of Comparative Migration Studies would like to use this opportunity to thank their reviewers for the continued support. Their expertise and hard work as a reviewer is invaluable to us and has helped the authors in improving their manuscripts. The reviewers’ work is extremely important for us to publish high quality papers. We would like to recognize the reviewers’ contributions by publishing their names. Special Issue entitled: The Civic Turn of Immigrant Integration Policies in the Scandinavian Welfare States. The commodification of mobile workers in Europe - a comparative perspective on capital and labour in Austria, the Netherlands and Sweden, by Mark van Ostaijen. Aspirations and the subjective future of migration: comparing views and desires of the “time ahead” through the narratives of immigrant domestic workers, by Paolo Boccagni.